The vision care market tends to increase attributed to the statistics of vision impaired population, for instance, 61% of the population in the United States need some sort of vision correction and 61% need eyewear due to “nearsightedness” (myopia), 31% need vision correction due to age related “farsightedness” (presbyopia), 48% of parents with children under 12 have never taken their child to an eye care professional and U.S. optical retail sales, excluding exams, totaled USD 17.2 billion in 2005, up 1.9% from 2004. Many of the important innovations in contact lenses originated from a wide range of scientific and industrial sources, The technologies of electronics, imaging, optics, and all of the other sciences are expanding exponentially which in the long run, then, contact lenses will make substantial gains as a form of corrective eyewear. Goldstein Research analyst forecast the Vision Care market size is set to reach USD 67.2 billion by 2024, at a CAGR of 3.15% over the forecast years. Various promotional campaign by the key players to capture the market share in the emerging countries and prevalence of eye disorders like myopia, hyperopia, astigmatism and presbyopia, technological advancement in healthcare industry are driving the vision care market. The report covers the present ground scenario and the future growth prospects of the Vision Care market for 2016-2024 along with the data of sales of total number of vision care based products & services worldwide. We calculated the market size and revenue share on the basis of revenue generated from major players across the globe. The Vision Care market is forecasted on the basis of revenue analysis, product benchmarking and strategic developments of key market players. Based on product type, glass lenses dominated the vision care market with the market share of 32% in 2016 attributed to the factors like lifestyle, comfort, convenience, budget and aesthetics, in addition, Glasses also can act as an extension of your personality and make a great fashion statement. LASIK equipments and contact lenses are the fastest growing market at a CAGR of 3.1% over the forecast period as overnight orthokeratology (Ortho-k) temporarily corrects myopia and LASIK surgery impair dioptre vision range. Vision Care Market Outlook 2016-2024, has been prepared based on an in-depth market analysis from industry experts. 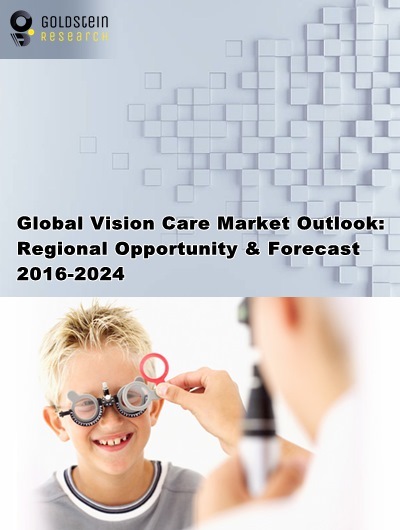 The report covers the competitive landscape and current position of major players in the global Vision Care Market. The report also includes porter’s five force model, SWOT analysis, company profiling, business strategies of market players and their business models. Global Vision Care market report also recognizes value chain analysis to understand the cost differentiation to provide competitive advantage to the existing and new entry players. Our global Vision Care Market report comprises of the following companies as the key players: Cooper, Essilor, Johnson & Johnson, Novartis AG, Luxottica, Valeant Pharmaceuticals, All Pro Intraocular Lens, Blanchard, CHEMIGLAS, Fielmann, Hongchen Optical, Hoya, Menicon, Rodenstock, Seiko Group, Shanghai Conant Optics, Synergeyes, UltraVision, and Wesley Jessen. According to the report, major driving factor is the shift in visual demands due to reliance on digital devices and improvements in glasses and contact lenses. The numbers of eyeglass and contact lens wearers appear to have grown at fairly steady rates since 2010, with eyeglass wearers increasing by about 5 million per year and contact lens wearers by about 1.5 million per year. Further, the report states the biggest challenge is the rapid shift towards corrective eye surgery which tends to impact the vision care market negatively as in mostly cases patients do not use any kind of vision care devices after the surgery . Based on geography, North America leads the Vision Care market and accounted for the revenue of USD 15.2 billion in 2016 attributed to femtosecond laser which is growing at a hefty compounded growth rate of 15.5% as the devices continue to increase in popularity and surgeons expand their use of Zeiss’ small incision lenticule extraction (SMILE) procedure. Increasing number of refractive surgeons and laser centers with changes in demand, increase in premium procedure share due to a higher share of femtosecond laser procedures, new advanced ablation patterns, and newer technology adoption tends to drive the APAC market (most commonly in India, China, Japan, etc). What is the revenue of Vision Care in 2015-16 and what would be the expected demand over the forecast period?